Ah, darn. No April Fool's jokes, today. Usually I have such fun, too! This time, I've just been crazy busy and I have nothing to show for the fool in me! I have to pinch myself, this morning as I giggle. I was just so stunned, last night! All night! You know, I didn't want to go to the banquet last night. Not because I don't enjoy them, but because I felt crummy. I'm so glad that I did! Bill had kept the secret for so long! Funny that we both went about life with secrets for each other for so long! I just pulled off a fantastic surprise party for his Birthday and he pulled this one off. Yay for both of us! Last night, while I was at the auction part of things, they started to talk about ifish and all of the sudden I realized, I was about to... oh no... they were going to call my name! Oh my gosh! Under the Hall of Fame awards? NO WAY! Ladies and gents, I am no good at this! My eyes filled with tears, and with a guttural voice I turned to Bill, and hid in those big rowing shoulders of his. "No, Bill! Nooo!" He pushed mat me and others pulled at me and pretty soon I was standing in front of a huge crowd, sobbing my eyes out. The Hall of Fame? The Northwest Steelheaders? Oh... my... word! No way! What did I ever do? And although I ask myself that, still today, and I asked many others last night, I still don't have a good answer. I started ifish... yes. But, the people are the ones who built it. The people are the ones who made things happen. The people are the ones who preach conservation and let events be known! My friend Thumper taught me that there comes a time when a business becomes the ownership of not only those in possession, but those that use it's resource, and thus, we have ifish. A community owned and created resource! There will be those on other web sites who will challenge and who will post negative things about me. I know that already! It's probably out there already, but I'm not going to look. I'll just giggle. I think that if I were a member there, I'd probably join in and say, "Yeah! Boy-oh-boy--What HAVE I done now?" Sometimes I wonder... when I have so much to do, and so little energy to do it with! Oh, LORDY... whatever have I done? Stan's new column for all to read! How many tournaments need promoting? How many ODFW meetings to be announced? Oh my! Anyhow, Fishbait wrote me a congrats, and Dad? If you are reading this, I'd like you to read it! You'd be so proud and this is all your fault, you know! I love you! Wow. I woke up this morning and had to pinch myself. I don't know what to say, except that I cried when they called my name. All I could think when they called my name, is "Oh, Lord. I'm so glad to be alive! I'm glad that I lived through my surgery!" The announcement was shocking and touching and I felt like, "OK, Lord, I can go now. This is as good as it gets!" front of huge crowds. I did that a little, and I met a few big wigs in the music world. Enough, anyhow, to satisfy my Mom, God bless her heart. However, my dreams were a bit different. I was indeed the black sheep of the family! It was my dream to rub elbows with the people who cared for those slimy fishes in the sea. I hid my STS magazines like some men hide um.... well, different magazines. I'd lock the bathroom door, fill the tub up with bubbles and read my STS mags! My sisters couldn't relate. "You like... fishing?!?" I've always been drawn to water. But-- how I ended up attracted to a computer and coding, I'll never know. I'll never, EVER know the answer to that! But, it happened, and it was a route that changed my life, and ended up allowing me to meet some of the all time great guides of the world. I am in heaven! I listen to fish conservation speeches and end up in the same condition that I end up after a good Sunday message at church. Weepy, but inspired and energized! I'm so so so honored to receive this award! And all that I've done is to generate communication between anglers, the angling organizations, and our public agencies. It was my hope to spread knowledge and to promote conservation. And regardless that it was not my Father's intent to go against mostly my Mother's wishes that I be enamored by famous piano players, it all started with my Father and Grandfather when they placed that first fishing rod in my 'little hannies" as a gangly little girl at Diamond Lake. I was forever in love with fishes, and any body of water as big, or bigger than a mud puddle. To heck with swimming and hanging out at the lodge, and buying penny candies at the store! I want to go with Grandpa out in the boat and put cheese eggs and Pautzke's on little hooks and catch big fish! And so when I started to learn the computer due to my disability about 12 years ago, I was drawn to tie the two together. I was challenged to create a web site that would be seen, listed in search engines, and draw people together. The first lesson I read online on how to do this was written under the header, "How to choose your theme." They taught that you should choose something that is your passion. That, my friends, was clear to me and it wasn't music. In fact, I had already done a web page on music, and frankly, the piano I designed with moving keys was cool, but the web page went no where. The fishing site, named "ifish.net", however, took off immediately . What does that tell you? I know what it tells me! And it all comes full circle to the Northwest Steelheaders. They were the first group of fish fanatics that I "rubbed elbows" with, and is still now the key organization for the enhancement of our fisheries and promotion of sportsfishing. Sure! It's fun and sometimes educational to hang out on ifish and talk fishing. It's great to get the word out on what's going out, online! However, there is no greater rush than to sit down in a large banquet hall and hang out with all of the long time fishing greats of our community at the Annual Banquet. As I stood looking at the crowd, I squinted my eyes to try and take in the many faces that I rarely get to actually SEE while I'm sitting at my keyboard, at home. If you are not a member of the Northwest Steelheaders, I suggest you sign up, here so that you can see them all, too! If we all signed up, and we all attended meetings, and we all told a friend to do the same, imagine what we could accomplish! We need more fishermen and we need to be and organized force in order to get things done. Thank you for this honor. Although I do not feel that I have done anything great like the rest of the people on this list, I do feel that the people that hang out and rub elbows on ifish, have. On behalf of the people of ifish, I will graciously accept the award, this year and say thank you... from the bottom of my little fishy heart. The world is all whacky! I had no idea it was icy out this morning, and when I went to take Kilchis out, winter had come back. It hit me with a blast! Wowee, but it is cold! This isn't April! At least it's not any April that I know about! The birds were a little quieter this morning, as I opened the door to an ice rink! I imagined them huddling on icy branches, shivering. Oh! My poor little freesia bulbs, all frozen in their pots! This isn't right! I just asked Bill last week, "Think it will freeze again?" We were wrong, weren't we? Global warming? Where are you when you are expected? I hope there is no damage. And oh, my beautifully fragrant daphne! Will you please be alright? Every day I bent over in anticipation of Spring's first heady fragrance. It hadn't happened, yet. Will it, now? Or did it freeze and shout the scent right out of those little blooms? My raspberries! My cherries, my apple blossoms, oh, my! Oh, how I hope that the freeze didn't cause you to die! I hear it's going to be warm this afternoon, and start warming up more and more, after today. Andrew came home all excited last night about his term paper that he wrote for school. The prof. told him that it was the best student paper he's ever read! He left this morning for school with a success smile on his face. I told him I'd make some sun tea and have it ready for him this afternoon. We like to sit on the porch and sip sun tea and chat. He is leaving for Los Angeles in less than 20 days for some big concert. He and his friends have it all planned and mapped out. They are driving. It's a huge 'coming out' event for these boys. I am excited and nervous for them. What an adventure! I kind of wish I were going. Or is it that I wish that I were young again, and had something like this planned, myself? Yep... sometimes I have that feeling! Don't you? For now, I'll just live it with my son... this afternoon, over tea. You know, sometimes I thought I'd be the Mother of two young sons forever. I think that during the years that you are so busy doing that, many of us can't see past it. Sadly, it does end. But, now, as I look back, there is a future and it's not so bad, after all! It's so sad to watch them graduate and move on, but to tell you the truth, I really enjoy my adult sons. I can't say that I enjoy it more than their childhood, but I enjoy it in a different way. It's nice to have companions, instead of having them so needy. Now, in fact, we meet each other head on, and help each other! We are a pretty good team, I'd say. We all take our weakness and strengths, throw them in a bucket, and where one falls short, the other picks up. David drives Andrew to school. I fill out computer forms for David's college, etc. We all do for one another. It's a great thing to have me cooking in the kitchen, while all three guys are hauling and stacking wood. We have a commune of sorts, and for right now, anyhow, it works! I've got to get busy, now. I think I'll make something special to nibble on at this afternoon's tea. Oh, the sunshine will feel good on these cold bones of mine! Much of the beauty in life, is waking in the morning. I get so tired and miserable by the end of the day. Sometimes I fall asleep just feeling like I'd just as soon drift off and not come back. But, then, as if by magic, I wake up most mornings totally restored and ready to go! What happens in the night? Do a thousand little elves go to work repairing things? Giggle. I think so! I just got back from the river. I adore being able to go down there with no one to see me. I can go in my robe and slippers and no one cares! Grab a hot cup of coffee, and put Kilchis on his leash and off we go! Kilchis is getting used to his leash. So am I. I have one of those release leashes, and I'm really getting good at it. It reminds me of fishing and learning to use a reel proficiently! I like to give him as much room as I can to be free, but yet when an eagle soars, or a dipper dips, I have to lock down tight and talk soothingly to Kilchis, so he doesn't take off running after it! The only problem is the leash doesn't have a good drag system at all! It's a darn good thing the leash is made of (at least) 140 pound 'test'. How do I know? Don't ask! But, I do know that it's held tight, thus far! Oh, the greens of spring! Every year I am just amazed by the depth of color around here. There is one brightly covered moss rock that signals the right of spring. It stands out brightly against the dark braquish waters that surround it. Is that a word? I don't know, but it sounds good to me! Sometimes, if you sit really still, the wildlife that spooked behind the lush greens that build the sidelines of the river are brave enough to come out again, and we are treated to the water play of weasels or river otters. They are so fun to watch! Especially now, with their new families learning to swim. Yesterday, Kilchis spotted a doe and her fawn. He pointed, frozen at them, as they in turn, froze. We were all frozen stiff, watching each other until they quickly bolted for cover. Delightful! Down the road, there is a spout of water that rushes from intense greenery on the roadside. It is so beautiful and since I've moved here, I've thought of stopping to take a picture. The water is so inviting! It's crystal clear. The spout is about a foot wide, and is so picturesque. Funny thing is that I'm sure it's not natural. It looks to come out of a manmade pipe, but with all of the green surrounding it, it's just perfect! I love the trip home from town this time of year. The road workers have yet to spray their poison that kills the overgrowth of Spring. Every day the road becomes more and more narrow and crowded with new grasses and shoots of trees and brush. Here and there are scattered daffodils and little purple surprise blooms to delight the passers by on the road. Oh! How I hate to see the poison truck! It's time to get Bill to put out the "no spray" signs. I'm always shocked how closely they come to the sources of water that flow into the Kilchis. You'd think we'd learn by now? Off I go. It's Spring, and I'm excited to experience the first forecasted real warmth for the day! I have begonias to plant and I think I'll get out my knee pads and get my hands dirty for a while. Oh, Spring. Take it in! Enjoy! Breathe! Be warm! Today is girly-girl day. Time to paint my fingernails pink, buy an Easter dress and start cooking in the kitchen for our family Easter dinner. I can't wait! It's also time to go get my hair done! I love that part! The most exciting part is that I get to unleash myself from an (almost) four legged dog. I get a break from acting as caretaker! YAY! Bill will be taking care of Kilchis this morning. I am free! You'd think that Kilchis would be sick of being leashed all the time, but I actually think he enjoys the closeness of all that we do, together. I don't think he used to get half the attention he does, lately. He's going to throw a fit when I walk out that door! Poor Bill! I never cease to be amazed how close in harmony my love for the outdoors fits with my love for my Heavenly Father! The Kilchis river that I live close to flows endlessly. The tall trees in the forest that tower above me, and the bursting green of undergrowth is made up of all things Spring-green and alive! Tiny shoots of freesia pop out of dark rich soil in my planter boxes. Fresh tender new sprouts of leaves burst out of old scraggly branches and remind me of the miracle of rebirth! Spring and all that exists in it is proof to me and I get up in the morning to be greeted by it, daily, this time of year! He arose! The birds sing! He arose! The smell of my Daphne bush! He arose! Just look! Just listen! Everyone, everything is shouting "Happy Easter! He arose!" I woke with songs going through my head, and as I opened the door to let the dogs out, I stopped short, as I so often do. This frustrates the dogs to no end, but I can't help it! They scrambled behind me to a stop. "What, Mom?" The warm moist air of spring blasted me back. An eerie glow of clouded light began to spread over the meadow before me, the birds test their voices like a symphony, warming up before a show. What a production! They conquer the season that breaks free from winter. They conquer the night with daylight! I feel guilty, because I didn't even get Easter baskets for the kids, this year. But, somehow it feels right. They are of age, now. We are past candy, right? (Yeah, right!) But, I want the kids to know that Easter isn't about candy, really. It's a miraculous day! Just look! Ya know, I'm wrong. I can see that the magic of finding candy hidden in the tall grasses is about miracles, too! I'd better go get some! But--I can't wait for our family tradition of the fruit bunny at my sister's home. We do that, still. The fruit bunny comes and hides baskets of strawberries, bananas, apples and oranges in the garden! Does your family have a fruit bunny? I wonder how my Grandfather ever thought that up? But, the tradition still lives, today! We are headed to the valley. It's going to be a great trip (over the river and through the woods) to my sister's house to eat, and eat, and eat! Strawberry crepes and smoked salmon, and pecan rolls! Oh my! I had hoped to get there early enough to go to church with my Sis, but I think it's too late. Therefore, I'll just have church all by myself, this morning! Join me? Things are good and fresh and new, today. I'm thankful. We had a terrible scare the other night. We let our baby chicks out for the first time, and lo and behold, one of our favorites, (they are all favorites, actually!) Snickers was missing. The night before, we had searched the grounds over, with a spot light. No luck. We all went to bed, worried. It was a long night's sleep without knowing where she was. However, we got up in the morning and found her! They are all so darling. We have named them all. We have "Anna Nicole", a platinum blond. "Snickers", a beautiful multicolor chocolate bird, "Liz" named after Liz of NSIA, (don't tell!) and "Boots" who has fluffy feathers on her feet! We love them all, dearly! Six years after the day on Easter where I woke to a herd of elk in the meadow, I still half expect to see them again. The Easter Elk! How great that was! I still believe in the Easter Elk! Don't you? The light is fully on the meadow, now, and it's time to slip my boots on and take Kilchis down to the river on his leash. He's so tired of leashes, but it is what it is. Time will pass quickly, and soon he will be running again, chasing dippers, and enjoying his freedom. He is doing so well! It is a miracle that he is on his way to healing fully. It is a miracle that I am alive, today. How many miracles can one girl take? I have so much to be thankful for in my life, and I'm never fully satisfied that I've let my Father know just how thankful I am. I have so many songs to sing! Happy Easter to you all! Look around you! Buy yourself or your friend some flowers, today, and plant them all around. Celebrate life with living and growth! The whole world before me outside shouts Easter. I wish you could see it. I just may take my camera with me, and take some shots of just how Easter like, it is out, today. I hope to see some redds out on the river. They've been oddly missing this year. Did they shoot way upstream this year, and miss us? Last year, our spawning area was just filled from shore to shore with redds and dancing, flashing steelies. This year, there are none. I leave you hoping to share with you the miracle of the Kilchis river Valley in springtime. Happy Easter to you all! And somehow I just heard the words that my Grandfather wrote shortly before his death, who taught me without question that God is all around us in nature. It is the season of green. I love it! Today, for the first time in ages, I get to flip a fly around. I'm a guest, going to a private pond with Bill and I can't wait! Fun! Fishing? Whazzthat? It's been so long! Kilchis is doing so well. I just can't believe how good he feels. He's my puppy, again! A wiggly, waggly puppy on all four legs! I really have to watch him, as he really thinks he's super dog, again! He wants to dig in the sand and run like the wind! Soon, Kilchis, Soon! I'm late. I'll tell you all about it, when I get home! Fishing! ha! Who woulda thunk? I just don't get to fish much, with the river closed. --And I haven't been in a boat for over 5 months! I don't get to do that, today, but soon! Oh yeah! I made outrageous sourdough bread last night. It finally came out! It was so good! I took pictures of it I was so proud! Today I am typing blind, so please hang with me. I have a terrible migraine and the first part of it is always ocular. Everything goes all fuzzy and electric looking on me. It's frustrating. I can't see small print. I can't see if I typed a period or not! My hands and feet tend to go numb. I find my disability very frustrating. It gets in the way of what I want and need to do. Sometimes I can't feel my feet, or my legs. Sometimes the nerves are so keenly working that a brush of clothing on my legs feels as if someone is cutting me with a knife. My work is extremely satisfying and healing to me. Now, if I were to just lay down, turn on the TV, grab a chocolate covered strawberry (that I do have in the fridge!) I still wouldn't feel better! Fact is, it doesn't make any difference what I do. My physical state is here to stay. If I lay down, sure, I'll feel a little better and rested in a bit, but no appreciable difference would be apparent. Not enough to do me well. My disability would still exist. And if I continue my work my disability will still be there, too! :) The only difference is that my efforts pay off for my overall well being. Getting something accomplished makes me feel better about me. It's healing to me. It makes me proud and it gives me yet more energy. Without ifish, I think I would lay down and just give in. Therefore, thank you, Ifish! I am so thankful that I have something to keep me alive! That's it, really. Ifish is my life saver! I'm glad I figured that out, this morning. I was just down at the river. My slippers are now soggy wet from the walk. There has got to be a word, a name for the style of walking I do on wet grass, to try to keep my feet dry. It's not tip toeing. It's a heel-first walk. It's "heel tipping!" Frankly, it doesn't work very well! I still keep trying to improve the art, though! Funny, when all this could be avoided by simply pulling on my boots. I was excited the other day to spot for the first time this season, the spawning of the steelhead! They are so extremely magical and beautiful in the water. The mood is always different down at the river, and is set, mirrored and magnified by as many cloud formations as the sky is capable of. I always think of the wash that I first paint on a canvas. The wash sets the mood and is to me, the most important part of a painting. Today it was dark and still and mysterious. It held an eerie forecast of doom in it. Something like the calm before a storm, but so much more. When you first spot a steelhead, you'd think they were long strands of waving moss attached to a rock. They don't appear to breathe half the life that you will soon encounter. The strands gracefully sway in the current, finning still and lifeless. Then, in an instant, seriously, in the blink of an eye, they come to life! Like a thousand leprechauns peeking out from under plants, you see movement! Don't blink! What was that?! My breath quickens and I hold. "A fish! That's a fish! Kilchis! A fish!" He wags his tail. He knows "fish". More than that, he can read my excitement of "fish!" He looks, too, but I'm sure he can't see them. He whines. To him, it's the same vision a stranger would see that wasn't aware of the life in the river, right now. Kilchis doesn't believe. That's because unless you knew, you'd never spot them. You'd never suspect the life that dances there beneath the ripples of current that he sees, on the top water. You have to know. You have to believe. You have to have faith! But after you are reborn into this realm, after you find your first one, the rest comes easier. Many of them show up, dancing all around you! The river comes to life! Sometimes I whistle for them, on my way. I giggle at the thought, but yes, I believe I can whistle for the steelhead, and they come. I have to stand still and stare and squint, especially through this weird vision... to spot them. After my vision settles on where I believe them to be, I'll finally see a flash of a hen, digging her redd. Now that's like lightning! It's undeniable proof, once you see that!! Aha! Faith producing steelhead! After that, the entire river comes alive like a water ballet! One can almost hear the orchestra warm up and the music begin to develop into a serious symphony complete with many movements of mood! The sky can change the wash on the canvas while I watch, and the music in the background changes from largo to spirtuoso and back again! I watch until I can no longer stand, and I know that I would give up long before, if I wasn't held by the magic! The river keeps me alive. I know it does. The river gives me energy. And what a great time of year, and what a Holiday for them to celebrate their reproductive cycle! Right during Easter! It's a miracle. It truly is! But, now, when I see miracles like what lies before me on this very day as I watch these fish, I realize that there are miracles all around me. How the trees stand, how gravity works, how tiny molecules work! Unexplainable, incomprehensible. miracles. As I stood contemplating this, yet again... a slight wind came up and in so doing, erased the slate of water, washing the wash of canvas away, and totally erased the life I had been watching. When the wind calmed and the water returned to it's glassy stillness, the steelhead were gone. Either that, or simply moved, and my eyes were too fatigued to search them down, again. I glanced from shore to shore and saw nothing. Nothing but a slate of blank water. In complete and utter fascination, I heel tipped back up to the house, and told you this story. Do you believe in spawning steelhead? Can you see them? Go down to the river... and see for yourself. I have to wonder if what I saw was real, even so. Those migraines can cause the weirdest illusions. Two little yellow birds came to visit me, yesterday! The first American Goldfinch of the year! That always takes my breath away! They are so beautiful! I just love them, each year! Funny how some people have them winter over, and it's no big deal. We are visited by them only seasonally, and when they show up, we mark it on our bird calendar. Yesterday was the day! It's always a race between Bill and I, who spots each bird first. This year, I've been so lucky! Even with my vision, I spotted the first Goldfinch, the first hummingbird. He spotted the first purple finch, though, and the first white crowns. I spotted the first bandtail pigeon. Oh, I love this time of year! Bill seems to prefer the wintering birds, but I just adore spring! I planted some seeds yesterday. Every time I do, I think fondly of my Grandfather, and how he planted the corn, shortly before his life ended. What a way to go. Sigh. He came in the house with his cane, tired from a day in the garden. He said to Grandma in the voice that still echoes in my mind, perfectly, "Grand maaaaaa.... I got all the corn in." Then, he half fell, and half sat in his favorite chair and took his last breath. On the farm in Forest Grove that still stands as a century old historical home, they lived off the land in perfect harmony. I honor my Grandfather and GrandMother with my spring garden, each year. They are in my mind, with each seed that I bury in the rich soil. I don't live like they did, but I strive to. The only thing that they purchased in the store was toilet paper and things like that. I have a list of his logbook, here. Take a look! My chickens are so cute, this year. I have a little one named Sniggers that jumps for joy, everywhere. She kind of intimidates the other girls! I wonder why she jumps? Kilchis is coming along wonderfully, and I only worry that he feels too good! I'm so grateful to have a puppy back. He's joyful again. He must have been in such pain. It really was aging him. Now, he's whirly and twirly and waggly and taggly. I just love him! I'll miss him, too! I'm going to meet my girlfriend from high school that I haven't seen in ages! I can't wait! We are spending the weekend together doing girly things! She has promised to help me remember to take all my meds, etc. She's very protective of me and she's fun to be around. I can't wait to see her and her Sis! It will be just like old times! And I'm off-- Have a wonderful weekend! I sure will! I'm going to start a new section on ifish about places to stay for the fisherman/woman, and their families and friends. Not only for fishing, but for fishing shows, too. I travel to fish, and I travel to go to shows. I figured that my experience in so doing might help others. I'll be commenting on that, soon. Time permitting, I will publish a section on this very thing. Until then, I'll just mention the places that I stay right here in my column. Need a place to stay while fishing the Willamette for springers? Well, I know about just the one! I stayed at the River Shore Hotel while working for ifish and also, while taking my dog into the vet in Clackamas. Click here to reserve a room, or to visit. This place is like home away from home. The people who work there are really friendly and caring. The rooms are clean. If you need anything, or simply want to chat, just step into the office and pour a cup of coffee or hot chocolate. The office people are terrific! I was greeted with a smile. These nice folks drop everything and attend to your needs, or simply stop to visit with you! I happened to have Kilchis with me, and dogs are always a great conversation piece. They lavished him with attention. The clean rooms overlook the river. From the minute you open the door, you feel comfortable. It's really fun to keep your eye on a boat, springer fishing and watch all the people fishing at the park, or launching boats. Talk about 'in the spirit of springer fishing'! It's all around you, here at the RiverShore hotel! There is all kinds of shopping up and down the hiway, and you are just a short hop and a jump from Clackamas Town Center by jumping on the 205. Are the kids hungry? There is a Mcdonalds within short walking distance. You know, when you look online for hotel reviews on epinions sites and such, it seems that most often you'll find mostly nasty comments and complaints. I think this is because most people will only write when they are upset. Most folks don't take the time to register and post a report if they were happy. Not so with this motel/hotel! There are good comments and not one bad one that I could find! I was so surprised! -- That is, until I visited. Now, I know why! I'm really proud to have the River Shore Hotel on ifish. If you have friends coming from out of town to fish and need a place for them to stay, comfortably, give them a call. The season isn't over, yet! I've got to tell you about the place I stayed this weekend. It is so cool! It used to be the Shilo, but now it is owned by Chinook Winds. Click here for the Chinook Winds Casino and Hotel. While there, I kept thinking what a great place this would be to stay at for the wife and kids, while the guys go fishing, perhaps out of Depoe Bay? The wife could shop, go over to the Casino, and the kids can stay at the arcade. It's so clean and cozy and you know what? It has no internet, so I was not able to work at all. You'd think this wouldn't be good for me? Muahahahaha... It was great! The surf was super heavy and my ocean front room was a dream. I felt like I was lost in a Mother's womb, the ocean churning all around me. I left both windows wide open and wrapped myself in warm blankets. I was in heaven! I can only imagine how good that would feel after a day's fishing on the ocean. Alright-- Off I go. I had a blast with my girlfriends this weekend. It's been so long. Man, how on earth did we all get so old? We are all in our fourties. Wow! Still, those girls sure have energy! I could NOT keep up with them! I'm off to find a hotel now for my Las Vegas trip to ICAST. I can't wait! And-- shopping for a good deal on a hotel is half the fun. I'll write about that, later! Usually, I stay at the Tropicana Hotel. Can you believe that I usually get rates as low as 29.00 a night? Believe it! OK, I'll try it this year and will let you know my results! Y'all remember that we are changing servers tonight. PRAY FOR US that it all goes well! We've had a few problems so far, but they are getting ironed out. ON THURSDAY MORNING, April 19th, at approximately 2:00 AM, we will be down to transfer the site for about 3-4 hours. Ifish will be closed at that time so that we don't lose any posts or info. We hope to be up by 6 in the morning. We'll see! Be patient, ya hear? The move is going well! There are a few bugs that we are stomping out, but all in all, man! It's so zippy to post on ifish, now! I'm impressed, big time! Yay and thank you to Vertexhost who worked so hard to get us up and moved! Thank you! What a busy life we lead, huh? I'm off to Portland to take David to a couple colleges for visitation. It's a beautiful day to do this, but man, life seems busy! The board is so busy that none of the mods can keep up. I so appreciate their work and help. Ifish just wouldn't be without them. They are our heroes! - Pour a new, hot cup of coffee with too much creamer and watch the birds from the kitchen table. -See the sun stream through the freshly cleaned windows. -Tiptoe through the wet grass till my feet are soaked. - Feel the tips of the wet branches on my neck as I make my way through overgrown trails down to the river. - Stare into the slow moving deep green current of the Kilchis. -See the flash of a steelhead, digging her redd. - Sit down and feel the warmth on the rocks where the sun shines. - Listen to my chickens talk excitedly about the new day, "Oh! It's my Mom! My favorite thing! Does she have treats!? No! Oh well! It's my Mom! It's my Mom!" 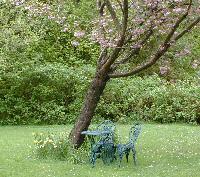 -Lay in the grass and look up into my cherry tree and enjoy the new pink blossoms. -Breathe deep. My soul needs it. I had a terrific time with Dave! What a smart cookie that guy is! I have so much hope for his future! I never get to spend time alone with him, either, so it was just delightful! I'm so glad we went, together! Bill took off to go clamming this morning. I wanted to go, but my legs wouldn't carry me let alone to clam! Yesterday at PSU, we had so much fun, but it took its toll on 'me long ones! We walked downtown. We were able to visit for a minute with Bill Monroe, when we noticed we were in front of The Daily Oregonian building. The city gives me energy and afterwards, I wonder if I should have 'energized' quite so much! I'm hurtin'! I just called Bill. He said clamming was poor, and he won't be bringing anything home to Mama. (!) No clams for dinner! Darn! However, he and Rev got plenty of good fresh air and exercise. He forgot the Asiago bagels at "Bagels By the Sea." Oh, those are such good treats. Bill can't stand the smell, though, and I think purposely 'forgets'. The boys and I have a thing for those nasty cheeses! The smellier the better! Oh! A couple weeks ago I spoke with the owner and operator of The Oregon Fishing Club, Bruce Harpole. He took Bill and I out to see some of their coastal properties. I was curious, as was Bill. Bill and I enjoy fishing ponds for panfish occasionally, and we miss that here in Tillamook. I've spoken to several of my friends, and read on ifish about the controversy that 'exclusionary' private fishing lands bring to the table. In speaking with Bruce, I came away with a positive perspective. Bruce says that the OFC doesn't take any private land away from anyone who had fishing rights to it, previously. They simply approach owners who have otherwise closed off their land to the fishing public, and invite them to be a part. They offer to care for their land, and to be responsible for their use by people who are willing to pay the upkeep to keep it nice, natural, clean, etc. Everyone seems to be happy. The members, and the owners, alike. "Nobody seems to have a problem when they hear we have 22 lakes and ponds that we stock with fish and set our own rules on. The rub comes when they hear we have access to 18 river properties. Somehow the idea that someone gets to fish a stretch of river from the shore, that they cannot, is upsetting. Of course, almost all of our Club river locations are accessible by drift boat, so the public has access to the same water, just not from the shore. This brings up the question of navigability. We feel that most of the rivers in the State should be declared "navigable" thus granting ownership rights to the public. To few rivers in Oregon have the "navigable" designation. Most of our Club river properties are in areas that are not declared navigable by the State of Oregon, but they should be. The Club takes the stand that these river stretches are indeed navigable and therefore should be owned by the public, so this is the policy we apply on those properties. What this means to our Club is that someone in a drift boat, as long as they stay on State property below the average winter high water line, can step out onto the gravel bars all they want. However, private land ownership begins above the average winter high water line, and those private landowners have the right to allow whomever they want to access their property. So, the Club takes the direct approach; we work agreements with landowners to cross their private property to gain access to the public waterways. It's pretty straight forward, we try to make it a positive for the landowners to allow fishermen on their property, instead of a negative. There are so many private property owners that don't allow public access, there's no need for us to work with anyone else. We try to select the private property that we want to gain access to, and then approach those landowners. Our landowners like the Club because it allows them to share their special property in a controlled way. It makes them feel good when people enjoy themselves on their property, However, in today's world most landowners are afraid to allow the general public to access to their property. Makes sense, doesn't it? It was nice speaking with Bruce. It was wonderful seeing how Bruce cares for the land, picking up trash as we walked. The pride he felt was obvious as he gazed through the waters and beyond, to the hope of fish, beneath. It makes him happy to be able to help the fishermen and women, and the land owner. What could be better? The OFC will not take land that was once open to the public and turn it into a private access area. They simply take closed land, and make it open-- but only to those who have the ability to help pay for the access and the care of the land and also vow to do their share in keeping the land in prime condition. Fair enough, I think! We even tried our luck with flies at the pond! Bruce and I were lucky enough to play a nice fat trout to shore. All fishing there was catch and release, so we released our fish, shook hands, and Bill and I left, chatting happily about how awesome the pond is! A pond for panfish! Yay! It was nice to actually hear his side of the story. He convinced me quite easily that his primary goal is to get more folks out fishing, while living a life that allows him to do what he loves. Fishing! I can relate to that for sure! Well, it's off to the land of bread making for this girl! It's the perfect rainy day for that! I cannot believe how consumed I am by my new hobby. Actually, I've been making bread for years, but this sourdough thing has taken my life over! I giggled while reading one site that goes so far into it that I was convinced that my obsession with sourdough was nothing compared to theirs! Look at this! Click around on that site and see if you don't think they are a bit nuts! I mean... taking the temp of your dough? Come on! I just received though, my starter in the mail and I've done nothing since then, but play with it. It's in my "bread room" right now, raising, and I'm waiting to do the 16 gazillionth step in making my sourdough bread! I've found that the ph of my bread is around 3.90 and the temperature of the room need not exceed 80 for this particular culture. However, my own culture needs a bit warmer and more moist environment in order for it to raiser properly. Please use the sourdough calculate to make sure your hydration is accurate. OK! I'm nuts! I'm nuts! Oh my gosh! You should see it! It's proofing beautifully! ...and it's a race! Man, April is flying by! We are being thrust into Spring! Can't say that I mind all that much! Oh, my, but my bread was fantastic! Look at this! Click on these for larger images! It was an all day project, and eating it took only 15 minutes! Was it worth it? You bet! This was the absolute best bread I've ever eaten! Seriously! And I made it! Yay! Here is the recipe, (It's the first bread recipe in the document) but I seriously think that it is the starter that makes the bread. You can order that, here. I was amazed at how bubbly the starter gets. It's magic! Anyhow, I'm so excited about it! I wonder what I'll make, today! I got this wonderful recipe for a lemon curd cake, but I have strawberries cut up and sliced for shortcake. Maybe sourdough shortcakes?! Off I go to church--. Have a great day! Thank you, Lord for sourdough! I sat at the dinner table last night, but just couldn't concentrate on my food. I picked at it with my fork. Something I've always gotten after my kids for. From the dinner table, the view out my picture window was just too captivating! A late feeding junco flitted from one feeder to the next. The night was drawing near and the light was fading. A dark and cloudy sky spread an eerie thunderous glow over the lawn. What a picture my window was! The blossoms of my cherry tree were nearly fluorescent! The small and fragile maple tree, by its side, a deeper explosive hue of red. All of a sudden, a brisk wind came and a shower of pink blooms flew through the yard! "Whoo hooo!" I cried out, and everyone stopped. The TV in the other room went mute. "What?" I heard Bill ask. "Oh, nothing!-- Just a great show going on, outside!" I began to eat my dinner, cold by now, and decided that we needed an azalea or two around these trees. Man, wouldn't that make the color in the yard pop, next year! It is so beautiful, already! A brilliant American Goldfinch lit on a feeder in front of me. Oh, the color! I give up! I can't eat when the world is so beautiful! The azalea on the side yard is in bloom, and it occurred to me that each year, the cherry trees and the azaleas bloom at nearly the same time. Oh, perfect! I've got to buy a couple more azaleas! I giggled, as I felt like a yard designer, a landscape artist... Paint me a yard! Andrew is leaving for a big trip, today, and I am so excited for him! He's going to see one of his favorite bands in Los Angeles, "Rage against the Machine" It is a festival, by the name of Coachella. He is so excited about it, and I don't blame him! He and two of his friends have packed a tent, sleeping bags, and they are driving! Wow! What a trip for a 19 year young adult! I'm excited for him, yes... but as his Mother, I'm worried, too! Not too badly, but a bit. They are very responsible youngsters. It's just that driving to L. A. is dangerous! I fear the grapevine for him, and remember how stiff my girlfriends and I became, as we approached that pass, headed to Los Angeles. The exhaust of a hundred freight trucks, the worry of overheating your car... all of that! I just keep having to tell myself that the world indeed, is a dangerous place. It will be alright. Right? He has promised to call, daily. Meanwhile, back at the farm, I'm traveling to Portland to meet with some business partners to discuss some ifish ideas. I'm excited about this, too! Oh-hey! One last thing! I went FISHING yesterday! The first springer shake down run of the year! No fish, but there was one other boat on the river with us. It was so nice to get out and cruise around, smell the bay air, get salt in my hair, and play with my array of spinners. I've got to add more dots to the back of my spinners, one of these nights. I really believe in yellow dots! Anyhow, 'tis the season and I've put in my first two hours of ten until I get my springer for the bbq! If it weren't for an occasional trip to the city, I would be unbalanced. I wouldn't know half the appreciation that I do, waking up to the birds, the breeze, the wind in the trees. As I walked to dinner, I felt as tall as the tallest buildings overhead. I enjoy the people watching! The energy of the city takes hold of me, and I am magically well. My legs don't ache so much, my muscles aren't as tired. My stride feels stronger to me, even though I'm sure I still have a bit of a limp. Fact is, I am alive! I am infused with the energy and the busy pace of the city. Even though I love the energy, I still get my dose rather quickly and have a constant pull towards the coast. I always have. I've tried and tried to move back to the city to be closer to my family. It never lasts. Each time, sooner than I've planned, I've put down a deposit for rent once again, and I'm getting in my car and heading over the coastal mountains. I have memories of the anticipation for coastal air that reach back to my early childhood. My breath still quickens as I hit hiway 26 from the city, head through the dark three lane tunnel and come out on the other side, transformed, "I'm headed to the coast!" Anticipation is strong as I quickly rise to the summit. My first peek at the Wilson river means 'home' to me, and I follow it around each corner until I finally start down again, and reach the little valley on the Kilchis river, where I now reside. As I park my car and turn off the engine, the cat coyly runs across the garage floor, just to give me a hint that she knows I'm home. She's much too private and proud to greet me. But not the dogs! They are full of joy as they scramble at the back door to get to me first. They heard my car a city block down the road! 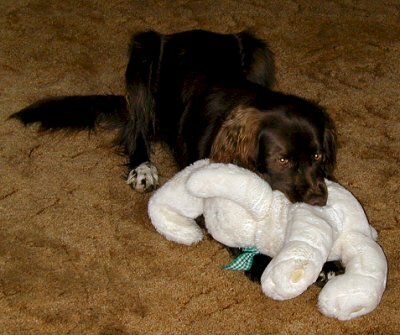 Kilchis grabs his bunny and proudly parades it around. "Mom's home! Mom's home! Look at my bunny! Mom's home!" And, as I take them out to the river for the first time, my legs don't ache so much, and I feel as tall and strong as the tallest old growth trees that survived the last 100 mph coastal winds. It takes the balance of a little city-a little country to make me whole. I live the most of my days out in the country along the Kilchis river, and I think this choice is one that most folks would make after dealing with the negatives of living in the city. The traffic, the pollution, the noise. And as I stand, quiet, along the river, staring into the dark green current, I spot a steelhead digging a redd in the shallows, and I am captivated by the magic! I know why I have made this decision, or why whatever is the will that pulls me here. The river will always be my home. Still, as I sip my morning coffee, and listen to the hustle and bustle of the city below, I can't wait to join the others heading to meetings, to work, to shop! I have one more day here, and then... and then I'll be pulled through that tunnel, and over the beautiful mountain pass, and onto home. To the river, where my heart leads me. The weather station is down. Ladies and Gents, if you know of a computer repair person somewhere around here, please let me know. I'll even drive back to Portland with this, but my life will be absolutely a mess if I can't restore this, or at least grab my ifish info off the computer and put it on a new one. It's about time to replace computers... I knew that. I just kept putting it off. They are expensive, you know! Plus, my comp was a wham dammy and I loved it. Now, bow your heads and say a prayer for my computer, please. For now, I'm on my laptop.